Simprolit insulation plate - is a composite product consisting of styrofoam, cement and special admixtures and it represents a part of Simprolit system for facade thermo-insulation. Simprolit plates are easy to work with, they are characterized by excellent adhesion between composite layers, having also good frost-resistance (a structure made of Simprolit SUP plates prevents joints from freezing), as well as exceptional high temperature resistance. All these facts are very important for the complete durability of a thermally insulated facade in any climate region (it is a well known fact that the temperature measured on the facade surface could amount to 80°C, depending on its color and rate of exposure to the direct sun light). Simprolit plates are mostly applied for facade thermoinsulation of already constructed buildings. Also, Simprolit plates may be applied as an intermediate layer between concrete and formwork, acting as a thermal protection of concrete facade walls, beams and columns. After dismounting of the formwork, concrete elements protected with Simprolit plates may be plastered immediately, or just skimmed without additional reinforcement or "rabic" netting. Application of Simprolit plates in upper floors and attics construction is also very practical. Namely, these plates can be used as both thermo-insulation and suspended ceiling plates, which could be just skimmed with cement paste mixed with fine sand, or with cement-based glue right after mounting. Upon request, they may also be plastered using a thin (3-5 mm) layer of cement-lime plaster, or just primed and painted. 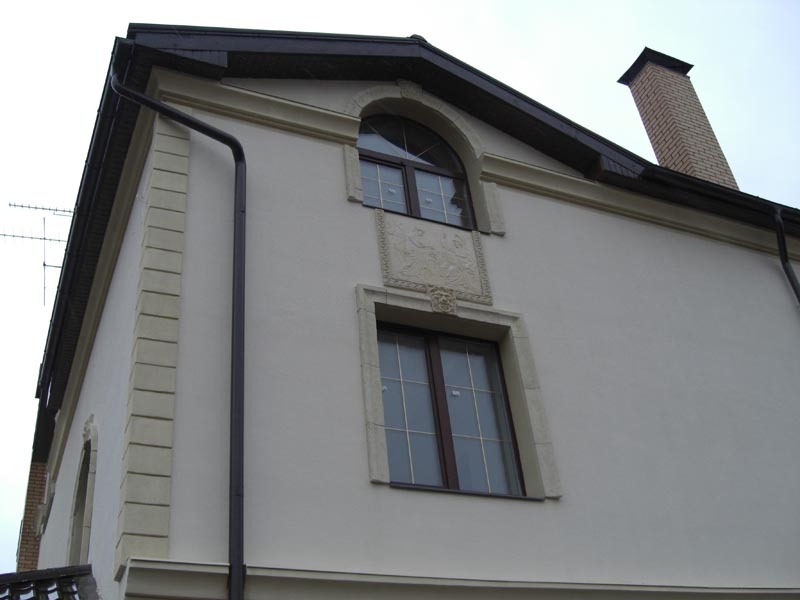 The application of Simprolit plates as a part of Simprolit system for facade thermo-insulation brings significant work and cost reduction, no matter if it is a reconstructed or new facade. 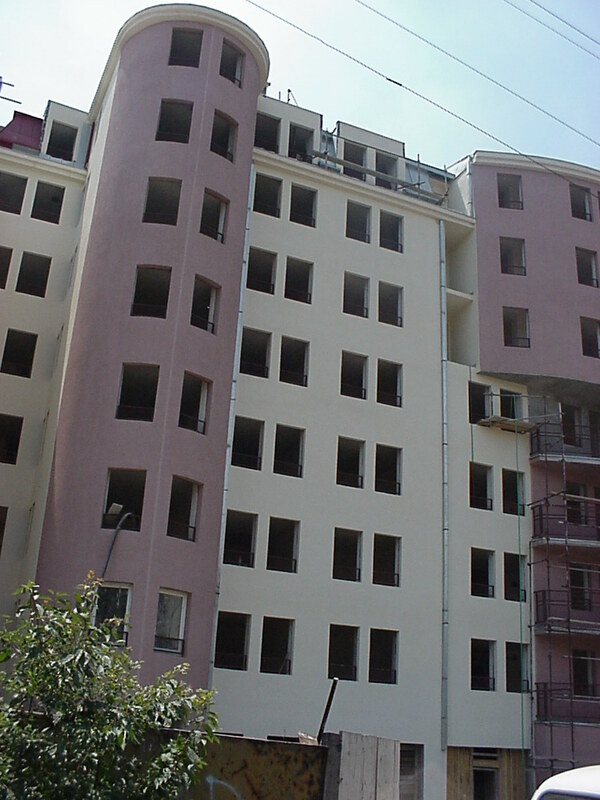 Simprolit system represents a system for thermo-insulation of existing and new buildings that satisfies a whole spectrum of engineering physics' requirements, such as: thermo-insulation, steam permeability, fire resistance, impact resistance, strength, resistance to extreme climate conditions and durability (unequaled by other similar materials). Except the above-mentioned elements, upon special design request it is also possible to produce other decorative elements (such as crowns, arches, ornaments, etc.) based on Simprolit polystyrene concrete. 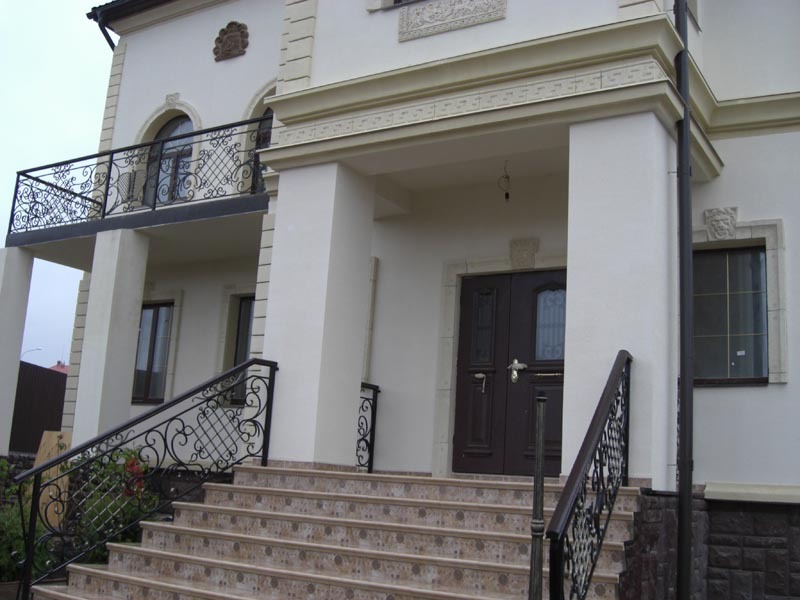 SOP plates are usually used for thermo-insulation of the plinths, around facade elements (crowns, arches, etc. 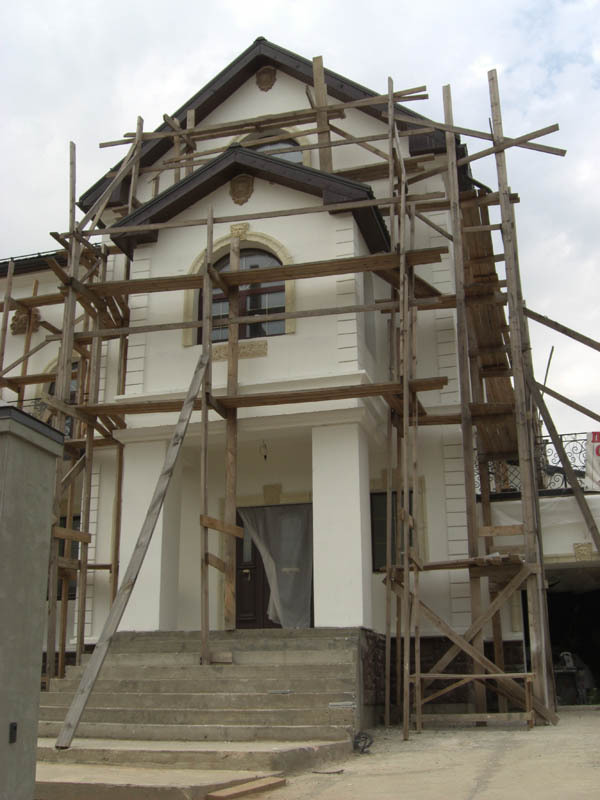 ), for edge surfaces of facade openings, but also for strengthening of building's corners, facade decoration and so on. 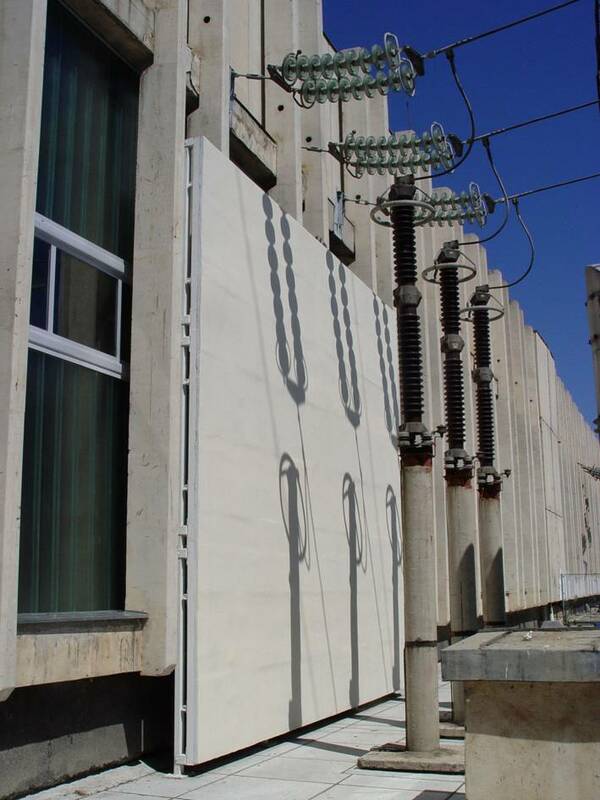 SUP plates are mostly applied as economical and good quality elements for facade thermo-insulation. Besides, they are successfully used for facade covering of panel structures, as a permanent solution for tight-sealed facade panel joints. Simprolit fireproof barriers (SPPR) are fire-resistant strips made of Simprolit monolith or Simprolit single-layer plates coated with cement plaster or glue (5 mm thick). They are usually installed around facade openings or at places where the facade thermoinsulation approaches the fire non-resistant roof structure. If there is a high risk of fire, SPPR plates could be placed at each slab level around the whole building, in accordance to the design and fireproofing regulations. The basic purpose of connecting elements is to fasten Simprolit plates to the wall, but also to fulfill other requirements defined by the Simprolit system, such as: steam permeability, frost resistance, fire resistance, durability, etc. Connecting elements include: cement-based glue, plastic plugs with special pegs made of self-extinguishing ABS plastic, plugs with metal or stone pegs (if so determined by the design and fireproofing regulations concerning high fire risk buildings) and bolts. All these elements must have appropriate quality certificates. Strength of Simprolit plates (and especially SOP plates) has no match between analog products. If the designer decides it, facade elements can be strengthened at certain places using Simprolit plates, especially at building's corners that may be subjected to impact. Strengthening elements also include "Г" profiles made of perforated aluminium or galvanized sheets. Lately, there are new materials, such as glass-plastic, applied for production of these elements. Basic function of plaster reinforcement is to avoid crack appearance. The cracks may occur at different parts of the thermo-insulation layer: at the plate joints, around facade openings, at the junctions between thermoinsulation and facade ornaments, at different materials' intersection, or as a result of too quick drying of the plaster layer. Normally, a glass-plastic net is used as the reinforcement, but additional metal "rabic" net may also be applied as a special protection against vandalism. Basic function of the plaster layer is to protect the surface of Simprolit plates from mechanical influences by strengthening the outer layer of a plate. Simprolit system does not require a thick plaster layer; on the contrary, instead of applying a 3-5 mm cement-lime plaster layer, Simprolit plates could be skimmed using just cement paste mixed with fine sand or standard ceramic-tile glue. 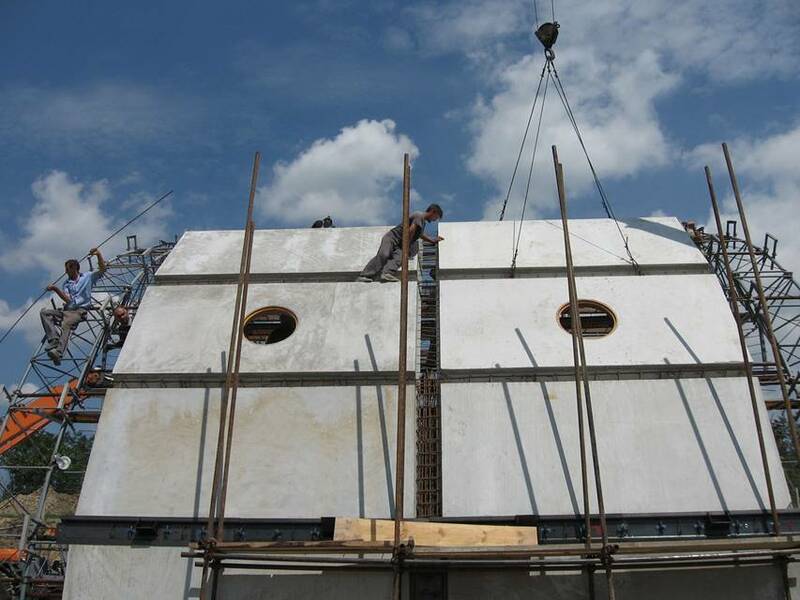 If the thermo-insulation layer has no openings for steam conduction, the final plaster layer must be steam-permeable (for this purpose, standard cement-lime plaster may be applied, as well as ordinary steam-permeable cement based glue). Basic function of the finishing layer – facade coating - is to protect the thermally insulated facade from the atmospheric influences, especially from the rain. The choice of the material to be applied as the finishing coat depends only on its steam permeability and moisture resistance. cost-effectiveness: production complexity and production costs, together with installation costs of Simprolit system elements are between 25 – 50% smaller then the costs of other similar materials. Simprolit plates are produced in dimensions and weights that are very convenient for installation. The fact that Simprolit system does not require smooth wall surfaces for installation (which is the basic condition in other systems, especially for thermo-insulation with mineral wool which requires a hard and flat wall surface) also represents a particular advantage. This becomes even more obvious if we add that very often a contractor spends up to 3 times more glue or plaster then necessary (according to the producer's instructions) in order to level the walls of an old building prior to installation of the new thermo-insulation. ecological cleanliness: problem of mineral wool's aging is a well known fact - due to increased moisture content and oxidation processes in time mineral wool becomes needle-like dust which is extremely health hazardous. On the other hand, when subjected to the same conditions high-class styrofoam may also produce harmful substances, especially when a low-quality production material or inadequate technological process is applied. Sanitary-epidemiological testing of Simprolit plates showed the presence of only 3 harmful substances (among 20 possible), and these 3 were found in minor quantities which were up to ten or more times smaller then allowed. strength: strength and mechanical impact resistance of Simprolit thermo-insulation system elements are much better then the same properties of analogue materials. fire resistance: according to the testing results of the Russian Ministry of Defense Research Center, after 90 minutes of fire-resistance testing of 110 mm thick 3-layer Simprolit panel (the middle layer was made of 30 mm thick styrofoam), at maximum temperature of 1000°C, limit state of integrity loss and thermo-insulation ability loss did not occur . 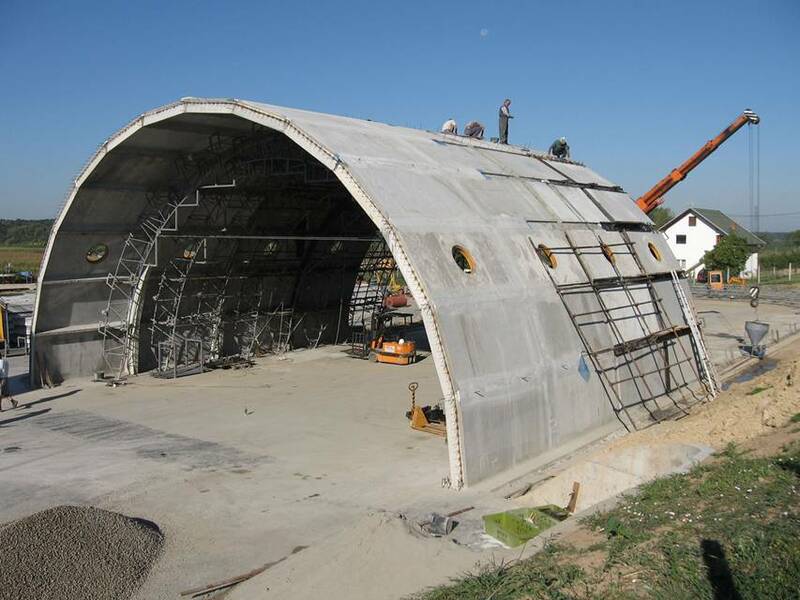 working with standard materials: existing thermoinsulation systems usually need a special polymer plaster to be applied over styrofoam or mineral wool plates, as well as special finishing materials, special technological procedures and consequently special work crews. On the other hand, Simprolit plates can be plastered using standard procedures, applying standard cement-lime plaster with just 3-5 mm thickness. Also, they can be just skimmed with cement paste containing fine sand or with steam permeable cement-based glue. 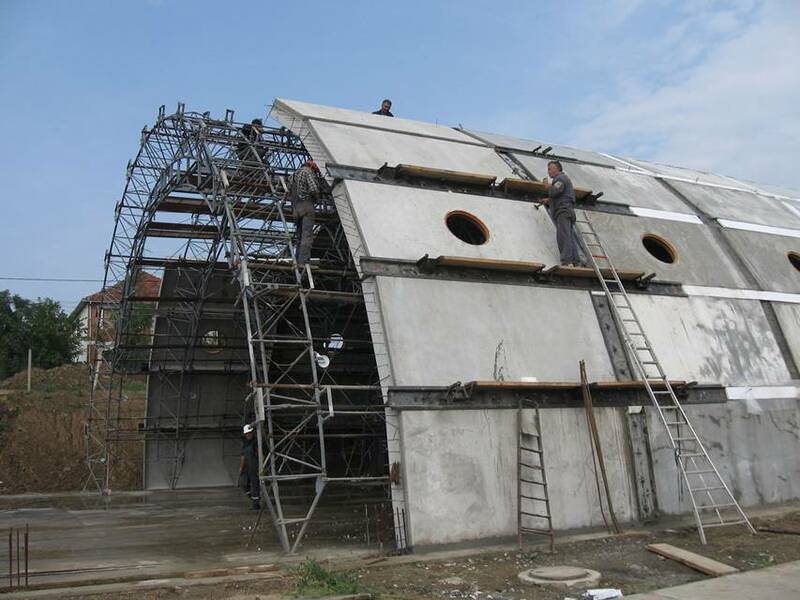 possibility of previous preparation: Simprolit plates can be previously prepared and adopted so that the finishing may follow right after their mounting to the facade (some of the operations such as grounding and skimming may be partially done before mounting of the plates). Simprolit plates are produced in standard dimensions length 1000 mm, width 750 mm and various thicknesses: 30 mm, 50 mm, 80 mm, 100 mm, 120 mm and 150 mm. Upon request, plates with other dimensions may also be produced. Dimensions of standard Simprolit plates are defined in accordance to the following criteria: optimum weight of the elements during mounting process, structural relation between width and length of elements being 3:4 - which reduces the deformation of plates, simple manipulation, proximity to standard spans with minimum dispersion (for example, for thermo-insulation of attics the plates could be built in between the roof beams almost with no waste of the material). SOP - Simprolit single-layer plates are completely produced using Simprolit monolith of class D 350. In comparison with three-layer Simprolit plates, the single-layer plates have lesser thermo-insulation ability, but on the other hand larger strength, steam permeability, fire resistance and impact resistance. In accordance to that, Simprolit single-layer plates are used for thermo-insulation of plinths, staircases, buildings' corners, around window and door facade openings, as well as at other appropriate places. Because of all the above stated facts, Simprolit SOP plates represent an important part of the Simprolit facade thermo-insulation system. Simprolit single-layer SOP plates are produced without folds, in one of six standard types: "SOP3"; "SOP5"; "SOP8"; "SOP10"; "SOP12" and "SOP15", were SOP stands for Simprolit single-layer plate, and numbers (3,5,...15) represent the plate thickness in cm (for instance: SOP5 stands for 5 cm thick Simprolit single-layer plate). Comparing thermical properties - heat transfer coefficient (K) and heat transfer resistance coefficient (R) of Simprolit SUP plates with thermically equivalent full and hollow bricks, the conclusion can be derived that 31 cm thick full-brick wall can be replaced with 3 cm Simprolit plate (SUP3), and 218 cm thick full-brick wall can be replaced with 15 cm Simprolit plate (SUP15). The middle layer of three-layer Simprolit SUP plates consists of styrofoam with 12-15 kg/m3 density, and outer layers are made of 10 mm thick Simprolit polystyrene concrete -class D300. Simprolit thermo-insulation plates are produced in two kinds (with or without folds) and in many various types (thicknesses). "SUP15" - 15 cm thick Simprolit thermo-insulation plates with folds. "SUP 15r" - 15 cm thick Simprolit thermo-insulation plates without folds.